The following individuals participated in the Wannsee Conference (Wannsee-Konferenz, Wannseekonferenz), held in the Berlin suburb of Wannsee on January 20, 1942, to achieve bureaucratic unanimity concerning the Final Solution of the Jewish Question (Endlösung, Endlösung der Judenfrage), a euphemism for the destruction of the Jews in Europe. SS-Obergruppenführer Reinhard Heydrich, Chief of the RSHA (Reichssicherheitshauptamt/ Reich Main Security Office) and Deputy Reich Protector of Bohemia and Moravia; ambushed in Prague on May 27, 1942 and died of his wounds on June 4, 1942. 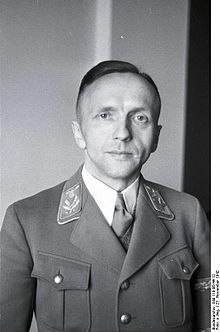 State Secretary Roland Freisler, Reich Ministry of Justice; killed in an air-raid in Berlin on February 3, 1945. SS-Sturmbannführer Rudolf Lange, Commander of the Sicherheitspolizei (Security Police; SiPo) and the SD for the General-District Latvia, Deputy of the Commander of the SiPo and the SD for the Reichskommissariat Ostland, and Head of Einsatzkommando 2; killed in action (or suicide) at Posen/Poznań, Poland on February 23, 1945. State Secretary and Deputy Reich Minister Alfred Meyer, Reich Ministry for the Occupied Eastern Territories; committed suicide on April 11, 1945 near Hessisch Oldendorf. SS-Gruppenführer Heinrich Müller, Chief of Amt IV (Gestapo) in the Reich Main Security Office; last seen in Berlin on April 30, 1945 – fate unknown. Undersecretary of State Martin Luther, Reich Foreign Ministry; finished the war in a concentration camp after falling out with Foreign Minister Ribbentrop; died in Berlin of heart failure in May 1945. Ministerial Director Friedrich Wilhelm Kritzinger, Permanent Secretary at the Reich Chancellery (representing Dr. Hans Lammers); acquitted of war crimes; died at Nürnberg on April 25, 1947. State Secretary Josef Bühler, General Government (representing Governor-General Dr. Hans Frank); tried in Poland for war crimes and executed in Kraków, Poland on August 22, 1948. State Secretary Erich Neumann, Office of the Plenipotentiary for the Four Year Plan; briefly imprisoned; died at Garmisch-Partenkirchen on March 23, 1951. State Secretary Wilhelm Stuckart, Reich Interior Ministry; imprisoned for four years before being released for lack of evidence in 1949; killed in a car accident near Hanover on November 15, 1953. SS-Obersturmbannführer Adolf Eichmann, Head of Referat IV B4 of the Gestapo; hanged at Ramla Prison in Israel on June 1, 1962. Ministerial Director Georg Leibbrandt, Reich Ministry for the Occupied Eastern Territories; charged with war crimes but the case against him was dismissed in 1950; died in Bonn on June 16, 1982. SS-Gruppenführer Otto Hofmann, Head of the SS Race and Settlement Main Office (RuSHA); sentenced to 25 years in prison for war crimes, but was pardoned in 1954; died in Bad Mergentheim on December 31, 1982. Ministerial Director Gerhard Klopfer, Permanent Secretary of the Nazi Party Chancellery (representing Martin Bormann); charged with war crimes but released for lack of evidence; died on January 29, 1987.